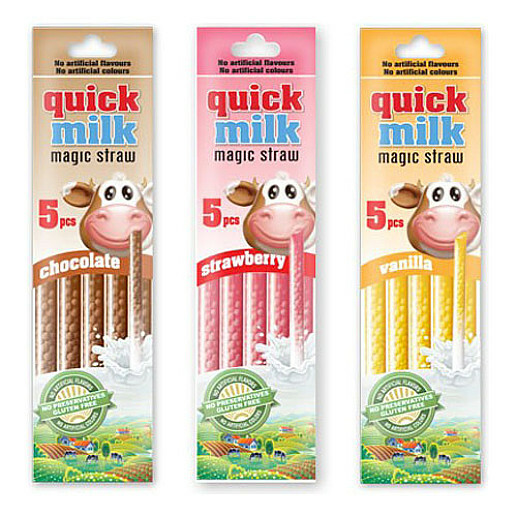 Quick Milk is a magical straw with little flavoured balls. The straw magically changes the milk to milk with a flavour, making it both exciting and fun to do! Especially kids will enjoy their milk a lot more! Quick Milk is available in four different flavours: banana, vanilla, chocolate, and strawberry. Quick Milk is free of artificial colour- and taste enhancers, conservatives, gluten and can also be used for soj milk. Pour a glass of milk. Place the straw in the cold milk, and let it rest for about 10 seconds in the glass. Drink the milk through the straw and enjoy!